This time of year, I really start to crave fresh produce and robust flavors...like garlic, basil and aged balsamic...yum! I honestly think tomatoes, garlic and basil could go with anything...oh yes, and cheese too! One of my favorites is Caprese...it involves simple ingredients, but it's the details, like heirloom tomatoes and buffalo mozzarella that really kick this up a notch. Heirloom Tomatoes-Try the yellow, green and multi-colored ones for a great presentation. Buffalo Mozzarella-Yes, milk of the buffalo...it's the BEST flavor, but hard to find. Fresh Basil, about a handful. I don't have specific amounts here...but you can eye it depending on how many people you're serving and the flavors you want. I like to toast my sliced bread in the oven broiler first....then as the bread is cooling, rub the garlic cloves on each slice. Arrange the bread on a platter. Slice tomatoes and Mozzarella and arrange over bread...cheese first. Drizzle some EVOO over the cheese and add some cracked pepper evenly. Add basil...I like my leaves whole. Drizzle balsamic oil and a little more salt and pepper on top. Can we say "yum!!?" This is a favorite of ours in the summer...great for outdoor entertaining. Yours guests will love the flavors...it's a definitely a crowd pleaser! Linked up to Tasty Tuesdays! Yum! These warm temps have my craving fresh salads and grilled dinners! Last night was my first bbq of the season, and I made a caprese salad on the side. It really is the best little dish to go with everything. Happy Tuesday! This looks great! It's so doable for me, too...easy and delish! I think I could eat that whole plate myself! Caprese combines my favorite things so I am definitely a fan! Looks yummy! Love the freshness of it! Count me in! I want those right now! I have always wanted to make these but have never gotten around to it. Perfect summer snack. yum! I will have to try this with our basil in the garden. maybe thursday as an appetizer when we have another couple over? thanks for the recipe! This looks delicious and healthy! Colorful, too. Thanks for sharing your recipe. I'll will have to keep an eye out for the Buffalo Mozzarella. This looks delicious! It's making me hungry! Easy, fresh and soo yummy! Caprese is one of the only things I can "cook." Will most def try this one out! Caprese is one of my favorite salads and nothing is better than heirloom tomatoes! Delish! yum yum yum! just had one for lunch yesterday! LOVE caprese. I never really liked tomatoes until I went to Italy and had caprese there. Best treat ever! I'm starving for dinner and really wish I had the ingredients for this! I love caprese salads! LOVE that this is a no cooking involved meal...and fabulously delish looking to boot! Win/win! looks pretty yummy and healthy to me!! That looks so delicious and healthy! I'm with ya - as soon as summer hits I crave fruits and salads! i'm loving salads right now too! looks yummy! This is one of my all time favorite salads. So excited to start eating these again! wow this looks to die for! I am loving salads so i am definitely making this one asap! Thanks for sharing doll! Yum Yum Yum! 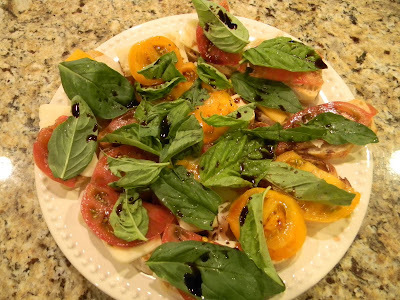 One of my summer favorites too - you can't go wrong with a caprese. The heirlooms definitely make yours look so pretty!